The daily commute to and from work makes everyday a challenge for many, from unexpected traffic to car troubles and everything in between. 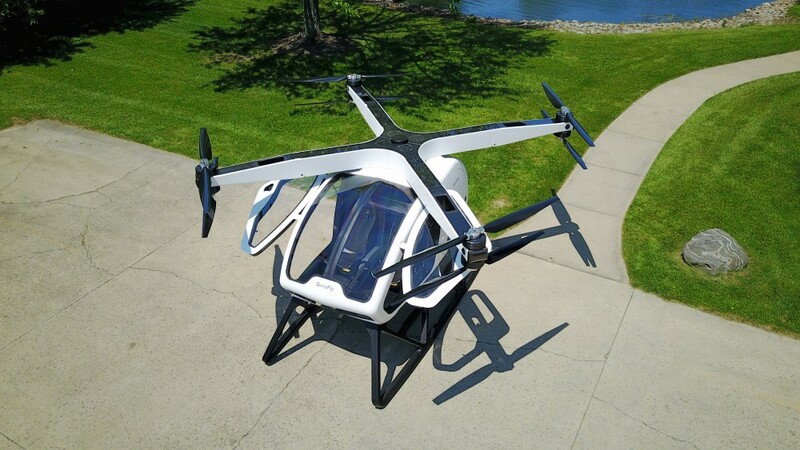 This is where the Workhorse Surefly comes in, this commuter helicopter is the biggest step towards flying cars that has been made yet. Revealed earlier this year at the Paris Air Show, the Workhorse Surefly is a two-seater helicopter that is about the size of a small car. As opposed to the traditional single rotor, this helicopter has four arms with two rotors on each arm, and the arms can fold so that the vehicle can be stored in a garage. Powered by a gasoline engine, the Workhouse Surefly also has two backup 7.5 kWh lithium ion battery packs that will give the helicopter time to land if the engine fails or runs out of fuel. The helicopter also comes equipped with a parachute that will be mounted in the center of the vehicle. The helicopter can only hold two people, and has a maximum carrying capacity of 400 pounds. The Surefly’s total range is about 70 miles or an hour of flight time with a flight ceiling at 4,000 feet. Being an aircraft, the person operating the helicopter will need a pilot’s license and 20 hours of training. Compared to the 1,500 hours of training needed for a traditional helicopter, the license for the Workhorse Surefly is fairly easy to attain. There is a single joystick for controlling the direction of the aircraft, and buttons to control altitude, while the speed is controlled by a computer. For those in the market for the Workhorse Surefly, the price for one of these helicopters is about $200,000.